ESTRO · 2010, Deutsch E. et al. 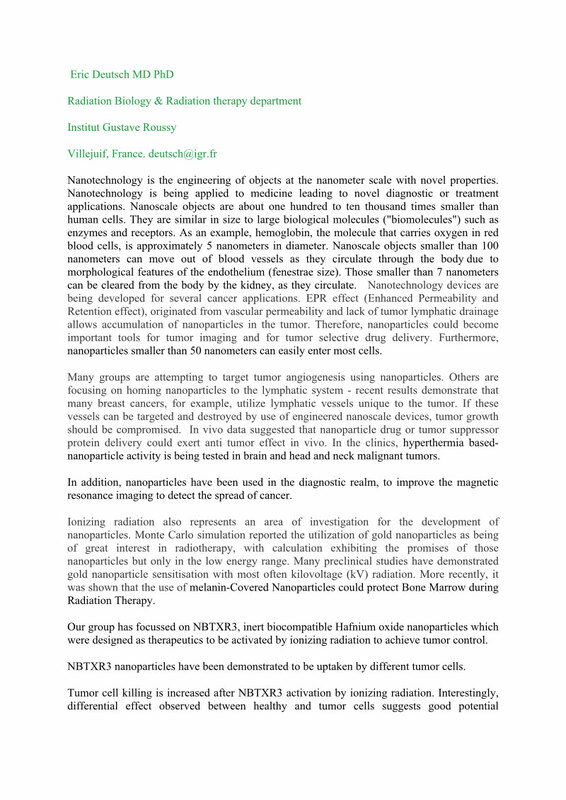 Nano Publications > Congress Abstracts > In Vitro in Vivo NBTXR3 > 2010 – ESTRO Abstract – hafnium Oxide nanoparticles as anti cancer agent – Deutsch et al. Nanotechnology is the engineering of objects at the nanometer scale with novel properties. Nanotechnology is being applied to medicine leading to novel diagnostic or treatment applications. Nanoscale objects are about one hundred to ten thousand times smaller than human cells. They are similar in size to large biological molecules (“biomolecules”) such as enzymes and receptors. As an example, hemoglobin, the molecule that carries oxygen in red blood cells, is approximately 5 nanometers in diameter. Nanoscale objects smaller than 100 nanometers can move out of blood vessels as they circulate through the body due to morphological features of the endothelium (fenestrae size). Those smaller than 7 nanometers can be cleared from the body by the kidney, as they circulate. Nanotechnology devices are being developed for several cancer applications. EPR effect (Enhanced Permeability and Retention effect), originated from vascular permeability and lack of tumor lymphatic drainage allows accumulation of nanoparticles in the tumor. Therefore, nanoparticles could become important tools for tumor imaging and for tumor selective drug delivery. Furthermore, nanoparticles smaller than 50 nanometers can easily enter most cells.